The computerized equipment ensures that the finished product is efficient and high quality. Modern technology, most specifically the use of CNC machines, has made it possible to produce high volume, close tolerance, tubular metal parts quickly and inexpensively. 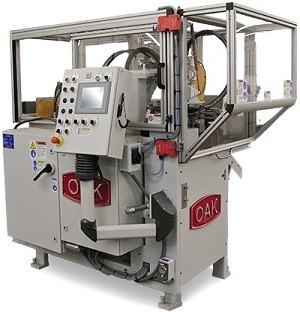 Tube Bending Equipment – Burr Oak Tool Inc.
Tube bending can be done using both cold and hot working processes. Often the process alters the mechanical properties of the original material. Tube bending equipment is used to supply products to the agricultural, construction, aerospace, automotive, electrical and medical industries, all of which depend upon several lengths and strengths of tubing in everyday operations. A tube fabricator can offer several standard shapes for tube bending, such as squares or circles, in addition to a wide range of custom tubing shapes. Tube bending is a widely available specialized service. The particular method used to bend the tube often varies according to the industry; some common processes include press, rotary, mandrel, and roll bending. Press bending is used on cold tubing and uses a die which is pressed against the tubing to form it into the desired shape. This process can cause some deformation of the tube cross section, so it should only be used when a consistent cross section is not necessary. Rotary bending is the most commonly used technique for tube bending. This method utilizes die sets to precisely bend tubing into very aesthetically pleasing shapes and bends. With rotary draw benders, complex bends can also be reliably reproduced. Mandrel bending is another option for forming tubes, and this process uses a metal rod, or mandrel, to provide extra support to the tubing. The rod is inserted into the tube while it is being bent to prevent cracking and wrinkling. Lastly, roll bending requires the use of a series of rollers to gradually bend tubes into the desired shape. Tube Bending Equipment Tube bending equipment is used to bend tubes and pipes using computer-controlled machines.